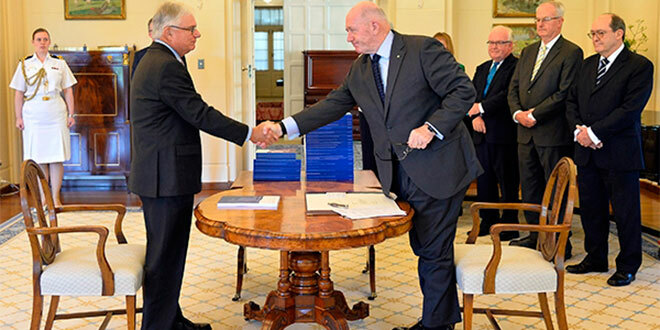 Major changes: Justice Peter McClellan delivers the Royal Commission’s final report into Institutional Responses to Child Sexual Abuse to Australian Governor General Peter Cosgrove. Photo: Royal Commission. THE Royal Commission into Institutional Responses to Child Sexual Abuse recommends prioritising child safety across the nation, including strengthening national and state laws, changing the culture within churches and organisations and providing for compensation and treatment for abuse survivors. 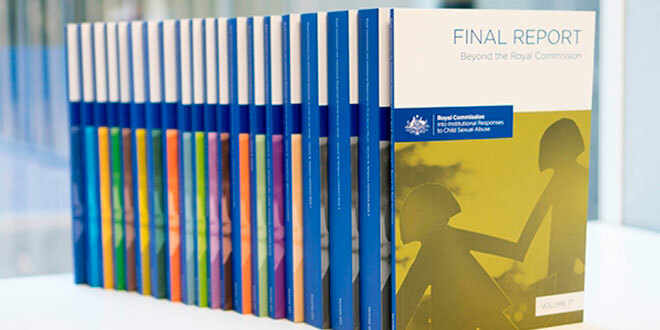 The Commission’s final report was released today, comprising 409 recommendations. Of those, 189 recommendations had not been made until today’s 17-volume report was released, ending a Commission of almost five years. Some of the volumes are broken down into books – the second book of volume 16 features almost 1000 pages on the Catholic Church. More than 60 per cent of child sexual abuse reported to the Royal Commission occurred within the Church or its institutions, and there are 21 specific recommendations for the Church. At the highest level the Royal Commission has called for a national office for child safety to be established in the Prime Minister’s office and a national framework for child safety to be introduced no later than 2020. “Australian society must never go back to a state of denial about the nature, cause and impact of child sexual abuse in institutional contexts,” the report said. It has called for nationwide laws requiring all adults to report known or suspected child abuse in religious and other institutions. Failure to report would be a criminal offence. The laws would cover clergy who fail to report abuse admissions made during religious confession. Catholic leaders have said they would not break the seal of the confessional. Any person in a religious ministry who is subject to a substantiated child sexual abuse complaint or is convicted of child sexual abuse should be removed from ministry, and in the case of a Catholic priest or religious should be dismissed. What are the recommendations for the Catholic Church? Establishing a national protocol for screening candidates before and during seminary or religious formation, as well as before ordination or the profession of religious vows. Amending canon law to remove the requirement to destroy documents relating to canonical criminal cases in matters of morals, where the accused cleric has died or ten years have elapsed from the condemnatory sentence. Establishing an Australian tribunal for trying canonical disciplinary cases against clergy. Introducing voluntary celibacy for diocesan clergy. Consider shortening terms of celibate commitment and/or voluntary celibacy for members of religious orders. Many of the recommendations to the Church would require a request to the Holy See from the Australian Catholic Bishops Conference, or from international leadership of religious orders, and many would require amendment of canon law. Brisbane Archbishop Mark Coleridge said the report revealed not only the appalling extent of the abuse but also the gross failure of Church leaders to deal properly with allegations, to deliver justice for victims and to co-operate with civil authorities. “These years have been an agonising journey for everyone, not least for the victims who bravely came forward to tell their stories,” Archbishop Coleridge said. He has emphasised the Church’s commitment to cultural change and to incorporate greater transparency and accountability in the governance of the Church. In Brisbane, Archbishop Coleridge said he would establish two working groups – one to examine every aspect of governance in the archdiocese and a second to review “how our current proactive policies fit in with the Royal Commission’s recommendations and what more the recommendations will require of us”. “We’ve begun to address the need for reform and renewal, recognising that confidence in the Catholic Church and trust in Church leadership are at an all-time low,” he said. “The rebuilding of confidence and the restoration of trust will take a long time and there’s no short-cut. 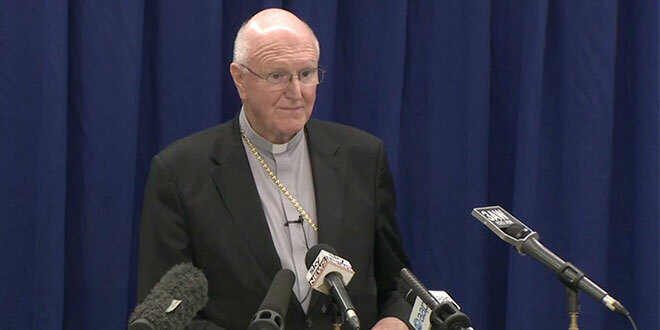 National response: Archbishop Denis Hart during a media conference following the release of the Royal Commission’s final report. Australian Catholic Bishops Conference president Archbishop Denis Hart said the Church would take all recommendations seriously, acknowledging that the Church had historically failed children. Concerning a recommendation that priests be required to report any knowledge of abuse during confession, Archbishop Hart said the matter had been raised with the Holy See and was “seriously being considered”, however, he said the seal of the confessional was “inviolable and can’t be broken”. “I will have to follow what the Church lays down on me, but that being said I would want to see with every fibre of my being to make sure that those things were reported,” he said. “I would certainly insist if a person came to me and confessed those heinous crimes I would refuse them absolution until they went to the authorities. “Or if a child came to me and said they were molested I would see that the conversation moved outside the confessional so that I could take them to a parent or teacher to see that that was reported. Sydney Archbishop Anthony Fisher described the issue of the confessional as a distraction. “Killing off confession is not going to help anybody,” Archbishop Fisher said. “This Catholic and Orthodox practice is always entirely confidential and I think any proposal to effectively stop the practice of confession in Australia would be a real hurt to all Catholics and Orthodox Christians and I don’t think would help any young person. On whether to consider voluntary celibacy for priests, Archbishop Hart said he stood firmly behind celibacy. “I believe that there are real values in celibacy where it is walking with others as Christ does, and that being supported by prayer and by a relationship which is broader than a relationship of marriage, and that is living as Jesus did,” he said. Former Prime Minister Julia Gillard, who established the Royal Commission in 2012, said it was now up to Australian politicians to complete the commission “journey” by pushing ahead with key recommendations including systemic change and a national redress scheme to deliver survivor compensation. “On this historic day, my personal thanks go to the royal commissioners and all who supported their work. Our nation is indebted to you and to the survivors who fought so hard for justice and a safer future for our children,” she tweeted. Although recommended by the Royal Commission in 2015 a national redress scheme is yet to materialise. Catholic Church authorities have already made total payments of $268million in response to claims of child sexual abuse received between 1980 and 2015, including for monetary compensation, treatment, legal and other costs. “Whether you get raped once, ten times or whatever happens to you, for someone to come along and say, ‘Well, that’s worth $2.50, or that’s worth $100,000 or that’s worth one million dollars’. Who’s going to come and say to someone, ‘And that’s worth that much’?” Perry Alan’ from a private Royal Commission session said. If you have experienced sexual abuse by members of the Church it should be reported to the police. The police have the capability to fully investigate any claims of sexual abuse. If requested, the Church will provide assistance to anyone in taking their allegation to the police and will fully cooperate with the police in any investigation. Previous: Will you give differently this Christmas?